Nathan Hill reviews the new Yasha nano aquarium from AquaMedic, and reckons it will be difficult to beat. My search for the ideal nano tank may end here, as I do not expect anything else out there to trump the Yasha for a while. The most obvious feature is the dedicated weir system at the rear. The aquarium appears very long from front to back, to account for the weir/skimmer area. The dimensions are 30cm/12" from side to side, 30cm/12" top to bottom, but 39.5cm/15.75" front to back, with 9.5cm/3.75" dedicated to the weir. So what you’re left with to view is a 30cm/12” cube aquarium with a black background. The divider between tank and weir is a single piece of pre-cut, pre-drilled acrylic, which slides directly into attached rails. There’s no play, no wriggling, and no difficulty in installation. Into the back fits the Nanoprop 5000 return pump, throwing out a belting 5000 litres per hour. The flow can be reduced by simply adjusting the power output at the transformer – which involves moving a switch. It really is incredibly simple to use, and doing this can reduce flow down to a less boisterous 2000 lph. The pump pushes into place and is secured by a rubber bulkhead. Critics will note that it’s not easy to redirect or aim, and that they cannot position the outlet for themselves, but that is just the nature of the design and something to be liked or lumped. I like. Next you have the Turboflotor Blue 500 skimmer. Bearing in mind that this is rated for up to 250 l/55 gal marine tanks, and that the Yasha is a scant 36 l/8 gal, this is overkill for the size. This is great in my book, as skimming is one of the single most important components to a marine tank, and something that some of Yasha’s rivals are conspicuously absent of. There’s no thinking required with the skimmer, and attaching the AQ750 venturi pump to it, the whole thing sits intuitively in the weir system, where it happily froths away, pulling out anything vaguely protein shaped. 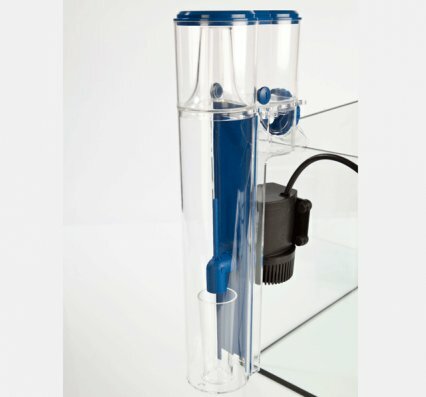 Given the high and obscuring design of the acrylic, when looking at the tank the ugly skimmer head full of skimmate is not visible. A small touch, but appreciated. Lighting involves three aquasunspot LED lights, each holding three 1w LED’s – one blue, and two of 10,000K white light. These belt out an impressive 150+ PAR at the base of the tank, and nearly 300 PAR an inch or two below the surface. That’s a lot of awfully good lighting. When first setting up the tank, one of the LEDs became faulty, fast overheating and becoming intermittent. AquaMedic assure me that this is an exception to the rule, with only one other LED unit returned through fault so far. Either way, a replacement was with me in next to no time. The lighting sits on long, low voltage metal frames, and the only real downside is that they are difficult to aim if trying to target one particular region of the tank. However, with the good spread of light that these units give, I don’t see this being a problem. Oddly, there are two notable absences. Firstly, there is no heater included. This is nothing new with the nano market, but given the attention paid to the other electricals, I’m surprised that this has been overlooked. The other thing missing is a base mat. Although it may be that this tank is designed to run in absence of one, I personally chose to sit mine on a thin layer of polystyrene. Call me old fashioned, but it’s not a risk I’ll take with any tank containing livestock. Some aquarists may desire a cover glass, but for me this is not essential. Designed primarily as a tank for inverts and not for excitable jumping fish, I’d say that if trying to add vertebrates to the tank then the responsibility to make a suitable cover is your own. Overall, this is the gold-plated Mercedes of the nano tank world. A superb, well conceived aquarium that stands proudly over its rivals, the only major setback for most will be the price. With a retail of £349.99, some people will say ‘whoah!’ straight away, but a shoparound will see this kit going for as low as £320 which is brilliant value for this setup.